A couple of weeks ago both my brothers made a trip up to San Fransisco. It was a short road trip and while they were there they Yelped a few restaurants to eat at. 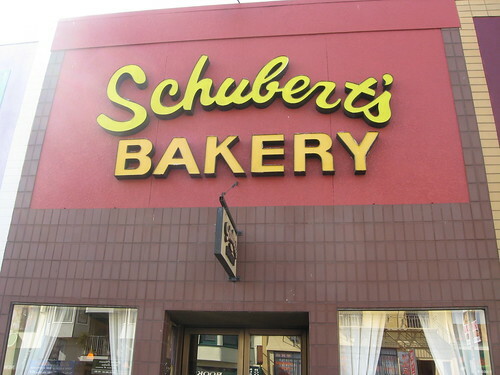 One of the most popular places for desserts was a place called Schubert's Bakery in the heart of China Town. They had borrowed my car to drive up there so as a thank you they decided to buy me some pastries to bring back of the uber popular bakery. 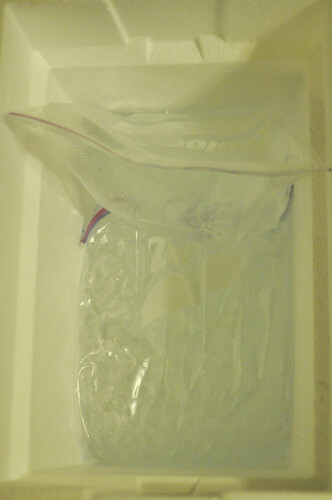 They bought an ice box at Target and filled it with ice so that it would stay nice and cool for the 6 hour drive down. It was actually really sweet of them. Unfortunately, I was in a bit of a sour mood so my reaction to their sweet gesture wasn't quite what they had expected. Regardless, I couldn't wait to dive in!! I'll go in the order of Not-so-Great to YUM! 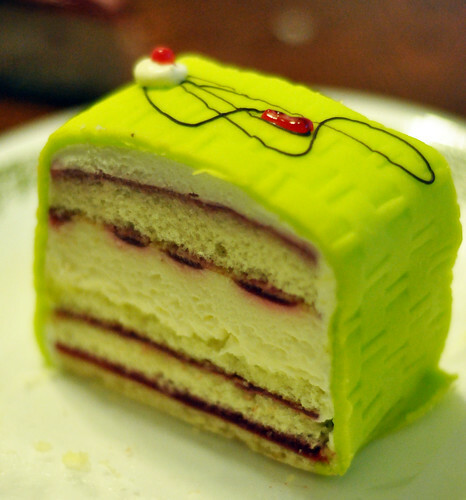 The bright green outside is marzipan, which is a sugar dough made of almond paste. 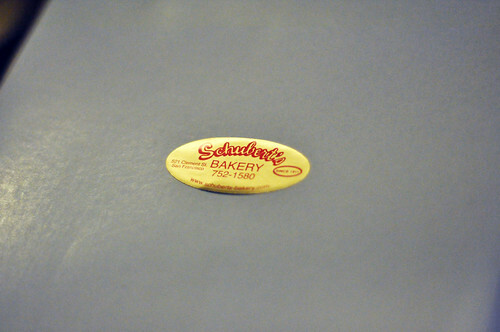 It's SUPER sweet and when used as a covering for a cake.. the thinner the better. 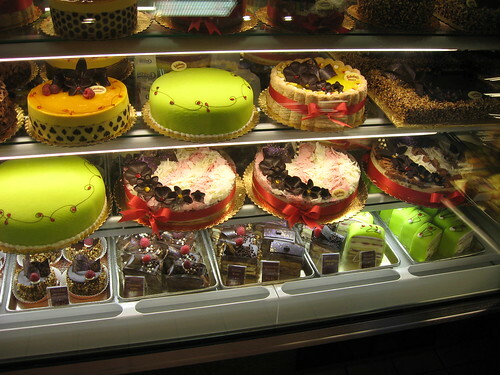 I took a bite and the sweetness in the marzipan totally overwhelmed any of the other flavors the cake had. There were layers of white cake laced with raspberry preserves with a vanilla mousse-type cream. It didn't have much wow factor. 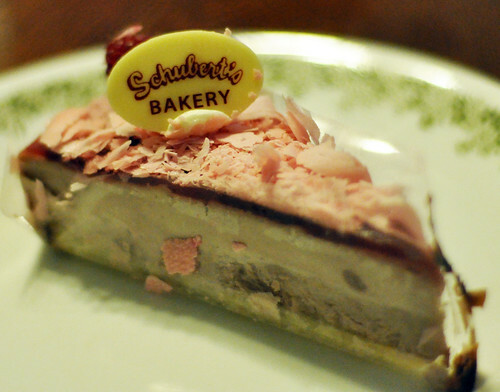 This cake reminded me of a cake I once got for Mother's Day at 85C Bakery in Irvine. 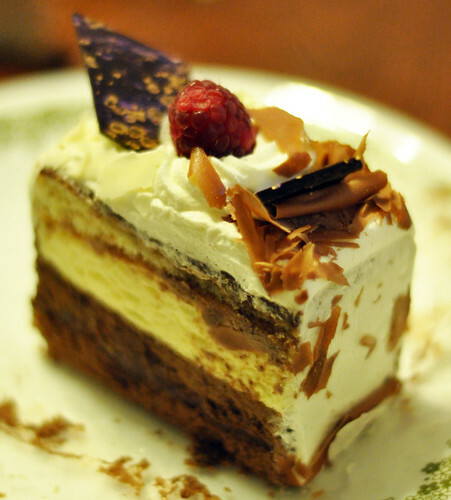 There's a thin layer of cake that encases the cake and mousse. 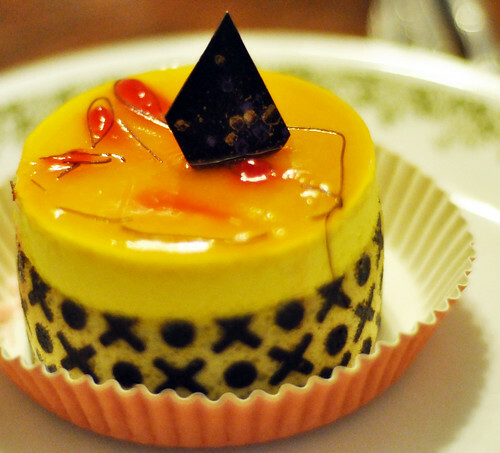 The top is a layer of gelatin. Looks gorgeous.. but flavor was absolutely lacking. 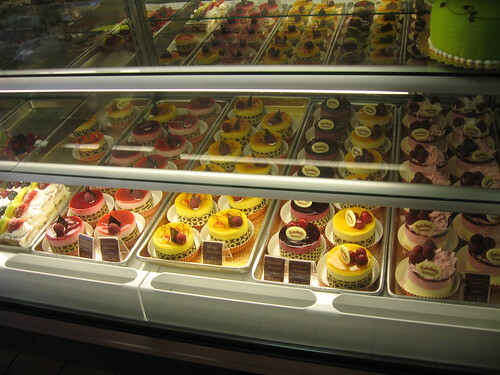 I'm sure you can guess how many times I've been back to 85C for their cakes. Completely unimpressive in terms of taste. The sign couldn't be more wrong. Maybe what it's referring to is "we had to get rid of all these left over fillings and cake so let's make it into something we can sell". Always be weary of something that's "special." It actually wasn't too bad it just didn't have much flavor. MEH.. for sure. This was ok. I think the strawberry flavor could have been stronger but overall, not too bad. This was one of the best. 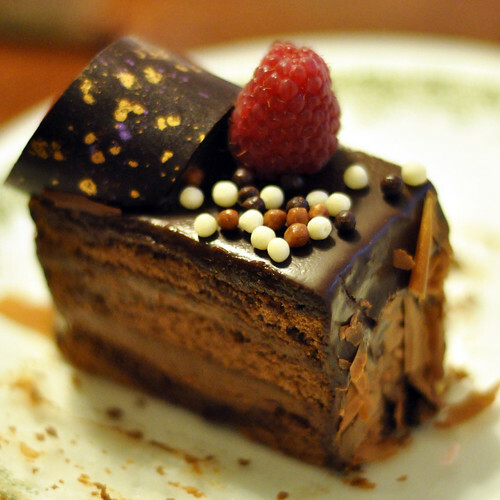 It wasn't too intensely chocolate.. it was moist.. and pretty good. I kept going back to it so it was definitely a bright spot. I'm not sure what this one is called because the photos of the case my brothers took didn't have this in the frame. 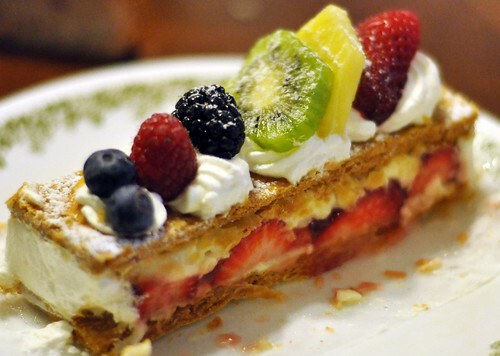 You can never really go wrong with fresh fruit, any vanilla cream, whipped cream, and a nice flaky crust. I've yet to find one that's done wrong. I don't like saying or reading negative things about restaurants or food.. but I was just NOT impressed with this place. It's rated 4 out of 5 stars with over 800 reviews in Yelp and I just don't see why. I give it 3 stars. 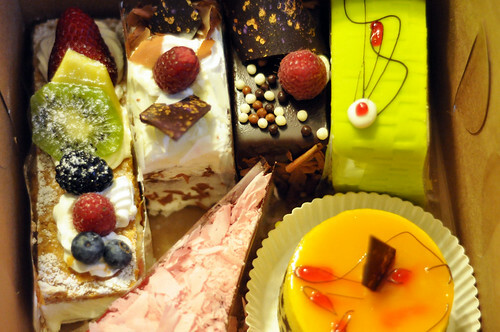 Sorry Schubert's Bakery.. but I'm a dessert snob. holy cow.. this looks KINDA ridiculous! My gut just busted out of my pants after looking the first 3 pix. Must do on the next SF trip.